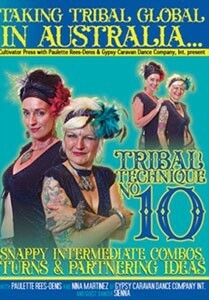 presented by Paulette Rees-Denis and Gypsy Caravan continues to build on their ever growing exciting repertoire of tribal bellydance moves with new intermediate steps and partnering combos, ideal for group improvisation. As always, we include a warm-up, our technique instruction, and drilling sessions for you to work on the steps and the transitions, along with a few moves from the past DVDs to practice. There is a short and inspiring interview with Nina and Paulette. Sienna joins in for the practice sessions, and we want to get you up dancing with these new ideas right away. May you always dance with passion, joy, well-being and peace. Many thanks for joining us on our tribal journeys.